How do organisms with common ancestry evolve unique traits and eventually diverge from each other? This question has been at the core of evolutionary biology since the theory of common descent was proposed over a century ago. 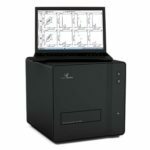 Recent advances in genomics and sequencing technologies have now made it possible to directly address this question by analyzing differences in genome architecture (i.e. location and organization of genes in the genome) between evolutionarily-related organisms. This has opened up new opportunities to evaluate how such differences impact gene function, drive the accumulation of new traits, and ultimately drive species divergence. In this study (Adomako-Ankomah et al., 2016), we tested one such genome architectural change – gene duplication – as a driving force behind the evolution of traits unique to the human parasite Toxoplasma gondii. An interesting feature of T. gondii is its ability to physically associate with mitochondria in host cells. We knew from previous work that this this phenomenon, referred to as Host Mitochondrial Association (HMA; see Fig. 1), requires a genetic locus called Mitochondrial Association Factor 1 (MAF1; (Pernas et al., 2014)). However, whether or not this trait was relevant for the parasite remained unknown. Fig. 1. 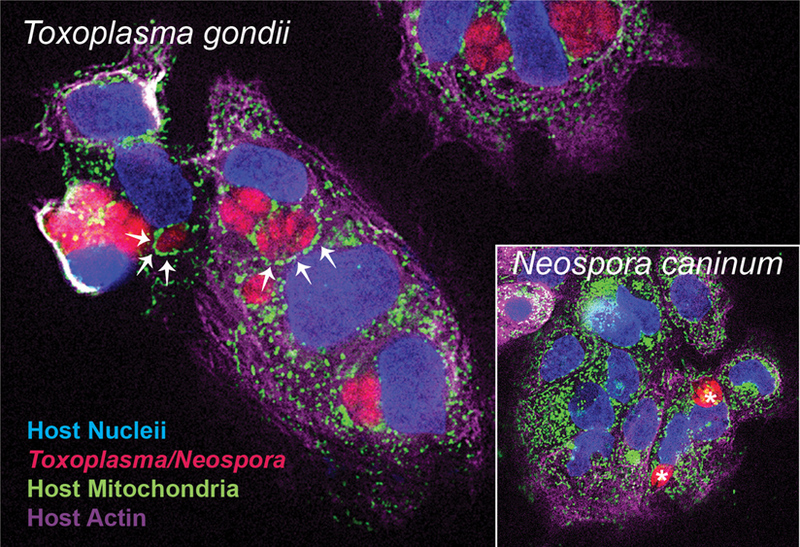 Using microscopy to compare the host mitochondrial association (HMA) phenotype in Toxoplasma gondii and Neospora caninum (inset). Human primary placental trophoblast cells were infected with either species (both of which where fluorescently tagged) and then the cells were fixed and stained for host mitochondria (green), host nuclei (blue), and host actin (magenta). Arrowheads indicate clear examples of HMA in Toxoplasma-infected cells, forming a ring around the multiple parasites replicating within the vacuole. Asterisks in the Neospora caninum image (inset) indicate N. caninum parasites, and a comparative lack of HMA. If the MAF1 gene was important in the biology of Toxoplasma, it would show signs of being under selection. 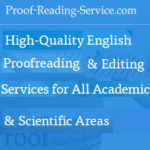 This could be detected by sequencing and comparing the gene from various Toxoplasma isolates as well as other species. 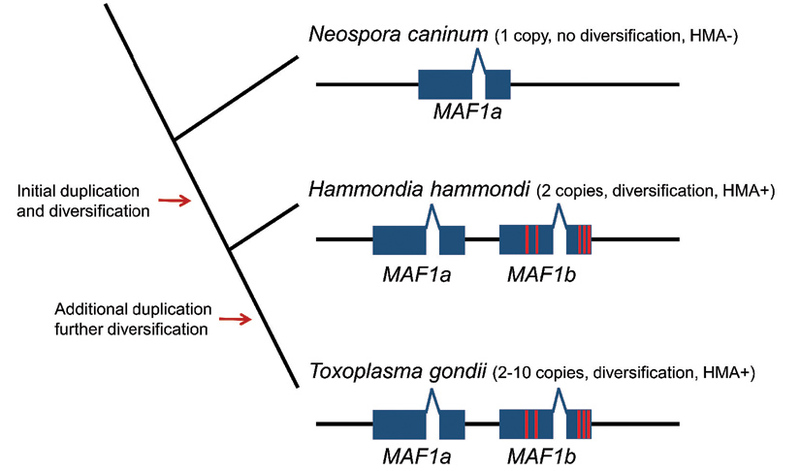 In the case of MAF1, there was an added complication to this approach: unlike most genes in the genome, MAF1 was duplicated in tandem in Toxoplasma and in the nearest extant relative of Toxoplasma, Hammondia hammondi (locus size ranged from 2 to 10 copies of MAF1). In contrast, we found that Neospora caninum, another close relative of Toxoplasma, only had a single copy of MAF1. Using DNA sequencing we detected significant sequence diversity in the MAF1 copies within the Toxoplasma lineage, and we found strong evidence that they had experienced selection-driven diversification (see Fig. 2). Fig. 2. Model for the evolution of HMA in Hammondia hammondi and Toxoplasma via gene duplication. We subsequently sought to trace the evolutionary history of the MAF1 locus and HMA using a combination of comparative and functional genomics approaches. While some Toxoplasma strains and Hammondia hammondi exhibited the HMA phenotype, Neospora caninum did not. A close inspection of MAF1 copies revealed a correlation between HMA and a specific subtype of the MAF1 gene (HMA+ allele; called MAF1b) which carries a unique amino acid motif: only HMA-competent parasite species (T. gondii and H. hammondi) possessed and expressed the HMA+ allele of MAF1. 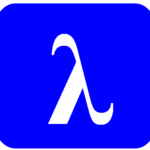 In contrast all species expressed the HMA– allele of MAF1 (called MAF1a). Importantly, artificially expressing MAF1b (but NOT MAF1a) in HMA-deficient species enabled the recipient parasite become HMA-competent. How do duplicate genes become fixed in a population? The fate of gene duplication is determined, to a large extent, by their impact on fitness. If the duplicate genes make the organism less fit, as is often the case, they are eventually removed from the population. However, in a few cases where the presence of an additional copy of a gene is advantageous to the organism, duplicate genes can become fixed in the population. 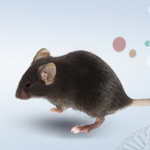 Results from head-to-head competitive mouse infections showed that expressing MAF1b (but NOT MAF1a) in a T. gondii strain that otherwise lacks the HMA trait offers a selective advantage to the now HMA-competent strain over its wild-type counterparts. While the exact mechanism through which selective advantage results from HMA is still under investigation, this study provides a very clear demonstration of evolution through gene duplication and subsequent acquisition of a new advantageous function (a.k.a. Neofunctionalization). It is unlikely that most organisms on the planet would look like they do if not for duplication-driven diversification of gene function. The beauty of this evolutionary mechanism is that having multiple copies of the gene allows for the some copies to accumulate beneficial mutations, while others can maintain their (possibly essential) primary function. As long as the mutations in the duplicate copies provide a selective advantage to the organism (as we have shown for MAF1 and HMA in Toxoplasma), these diversifying versions will be retained, and ultimately fixed, in the population. Host Mitochondrial Association Evolved in the Human Parasite Toxoplasma gondii via Neofunctionalization of a Gene Duplicate. Toxoplasma effector MAF1 mediates recruitment of host mitochondria and impacts the host response.